Only unit with own hi-speed secured internet. Can stream HD. Romantic and Luxurious. Spectacular 12th floor, one-of-a-kind penthouse with 180 degree views. Step into this totally remodeled Tommy Bahama dream vacation. When we look to stay away from home, it is so important to us that we feel comfortable when we walk in the door. We have created a wonderful space where you will want to spend time together. We know the difference! You won't be disappointed and will find our Penthouse to be everything you hoped for. As you enter #1216, you will see floor to ceiling windows with views of the ocean, whales, sunsets, canoes, sailboats, and the Islands of Molokai and Lanai. Being on the Penthouse floor offers total privacy and the Mahana only has a handful of 12th floor units. When you're on the 12th floor nothing obstructs this spectacular scenery or the feeling of seclusion in Paradise. From the 'Tommy Bahama' style Living Room and Dining Area the wall of mirrors enhances the views everywhere you look. 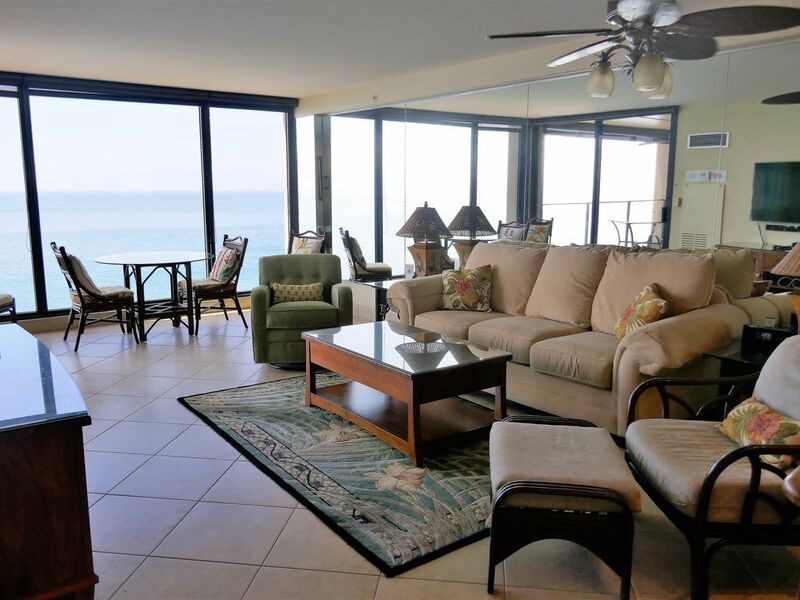 Whether you are dining on the lanai with the ceiling fan and light for romantic evening dinners or watching surfers while enjoying lunch, the views are unparalleled. The lanai features travertine flooring, table with four chairs. Our lanai furniture is stackable and easily movable so you can be assured of sitting in the shade on hot days or moving in the sun to get a tan. Sleeping well is so important to us and we think it is important to you. Our luxurious California King is the top of the line Tempur-Pedic Grand plus down pillows providing you with the most restful sleep you will ever experience. You can lie in bed and watch the moon on the ocean or step through the sliding doors to your lanai. The bedroom decor is tropical and lovely. The custom gourmet Kitchen features cherry cabinets, granite counters with arched ends, all GE Profile stainless steel appliances, side-by-side refrigerator with filtered ice/water dispenser, microwave, oven with convection and all appliances necessary for your comfort. The extra large walk-in shower stall with bench is done in travertine. There is travertine tile flooring throughout. The washer/dryer stack is behind mirrored closet doors for your convenience. Flat panel TV's include HD and Showtime/HBO, CD, DVD and VCR are in both the Living Room (55' Samsung HD with Blue-Ray player) and Bedroom as well as ipod docking stations and are just a few of the exceptional appointments. Plush, new Bassett sofa. Koa appointments. No expense was spared on this luxury Penthouse unit! Our Penthouse, #1216, will delight the most discriminating traveler. Whether you are coming to Maui for your Honeymoon, Anniversary or a well deserved vacation, you will want to call us when 'Only the Best Will Do'. The Mahana is a 12-story Condo Resort with a beautiful swimming pool, hot tub, BBQ area, tennis court, shuffleboard, ATM, computer terminals and coffee/snack cart on-site.DSL/Wi-Fi is available in the condo/hardwired and through-out the building. Restaurants/bars, grocery, farmers market are within walking distance. Enjoy world famous, snorkeling, surfing, fabulous beach walks and golfing. Excellent concierge service for water activities, luaus, theatre, helicopters, and sailing trips. Minutes to Lahaina, Ka'anapali and Kapalua. Call or email today to reserve your very special vacation! Hi. We are Michael and Kathy Rain,owners of #1216 Penthouse at the Mahana. We are Realtors in the San Francisco Bay Area with Coldwell Banker Real Estate and are very particular about properties. Michael is also a professional musician playing guitar for over 55 years with 2 CD's including one Hawaiian CD called Island Rain. We are passionate about each other after 39 years together and our love of Maui. We are avid hikers and have had the most incredible hikes around the Island. The Mahana is our second home and our goal is to rent to couples that would like to feel like it is their second home too. Aloha Nui Loa. As long time Realtors in the San Francisco Coastal communities, we wanted to find a view vacation home that was as good or better than what we have at home. When we decided to purchase a vacation home in Hawaii, we visted the 4 main Islands as well as Lanai. We looked for an Island that would have enough to do without the big city feel and population and where we wouldn't have to be concerned with major bad weather. Maui was the perfect choice. We went to every part of the Island and settled on North Kaanapali Beach. We looked at every condo complex and found that the Mahana was the only all oceanfront condo. We also loved the fact that the bedroom faced the water instead of the mountain. We only wanted the top floor, 12th-Penthouse, and we wanted the Lanai building. We found the perfect place. We love the fact that there is a reef in front of the Mahana which means that to access the water, you would have to go 100 yards in either direction. This keeps the beach activity and noise in front of our condo down to a minimum. There is boardwalk that starts just south of our building that goes all the way to the Hyatt Hotel which about 2.5 miles. What a wonderful walk to get coffee or 'earn' your lunch at the many great places in Kaanapali. BTW, we also continue walking south to Lahaina. The Maui bus system is great and we can take a return bus ride that drops us off 1 block away. There is no closer unit on all of Maui with floor to ceiling windows to see the view from the living room and bedroom/lanai. Always on automatically as long as the lanai doors are closed or you have turned it off. Located in the Living Room and Bedroom. New Stacker Washer/Dryer is located behind mirrored doors in the vanity area of the bathroom. We have our own High Speed 30mg connection which is double the connection of other units at the Mahana. Located throughout the unit, building and grounds. Also a hardwire connection available in our condo double the speed of the building's connection. Floor to ceiling window with 2 Island Views. 110 sq.ft. lanai off Living Room and Bedroom. Stainless Steel GE Profile dishwasher. GE Profile side by side with dispenser for filtered ice-crushed or cubed, and water. Custom gourmet kitchen with granite counter, arched corners, granite backsplash, Cherrywood cabinets, travertine tile floor with 20' tiles on a diagonal. (2) UPGRADE:Flat panel screen 55' TV is located in the living room and 32' TV in bedroom. Both are connected to Digital/HDTV Cable including HBO and Showtime. Newly tiled pool with deep and shallow ends. Surrounded by custom stone walk and glass windbreak. Walking into the condo your first impression is the stunning view! Second, we were impressed by the quality of the unit. Everything was in working order, clean, and comfortable. Even though our stay was at the end of the whale season we were able to catch whales breaching as well as turtles up close to the shore! We really enjoyed our meals on the lanai with such privacy. Though we were there for two weeks we still didn't get to see all that we planned so hopefully we will get to return and if we do we won't hesitate to stay at this lovely condo. Lovely condo with unbeatable ocean front view. We had a wonderful experience, and I would stay again. However, our stay had a rocky start; the check-in computer showed that we did NOT have a reservation. I called 2 cell phone numbers and sent an email, but the owners were out of contact on a flight. Finally I tried 6 variations on the spelling of my name in the computer system. Success! Day 2 started with a toilet clog. I reached Kathy on her cell phone, and she quickly arranged a fix. Great time and great views!!!!! Views were terrific. Would suggest more lighting above the table or moving it to under the fan. Everything was great, clean and very pretty Saw lots of marine life from the lanai. Would recommend to others. Wonderful location for whale watching. Well managed building and well maintIned unit. Will plan to return. Only suggestion is for the unit to provide a couple of beach chairs. Condo is well furnished your own WiFi very quiet except for the ocean waves. Complex is clean friendly staff Covirntly located. Whales whales and more whales. Oils stay here again in a heartbeat. Nacho grande across the street isn’t much to look at but carne Asade burrito is the best we have ever had. Overall this condo is a can’t miss. No beach chair or umbrella but with all it has to offer those are easy to rent. Thanks for the wonderful stay !!!! We loved our stay here. The unit is great and so is the building. The view is awesome. It is gorgeous to begin with, with Lanai and Molokai in the distance and we watched whales breaching, tail slapping, etc. (with help from our binoculars) from the main living area as well as the lanai. The windows were clean both inside and out, the bed was comfy, wi-fi worked great with its own password protected network (for this unit only), the grounds were well maintained, parking was easy and the elevators were fast. There is a coded gate between this property and the one to the south, which knocks off AT LEAST 5 minutes from what Google maps shows as walking times to locations to the south. The code comes with your parking permit. Self check-in was a breeze. We would stay here again in a heartbeat.